Simple and classic – these words describe Fruit Slots well. This no-frills but all-action online slot gets straight to the point. If you're after a more traditional online gaming experience, then this colourful offering from Microgaming fits the bill. The uncluttered look extends to the gameplay, where are three reels, one payline and 12 possible winning combinations. If you've ever enjoyed old-school slots in a bar or pub, then you'll feel right at home here. It's also great for beginners, as it's easy to understand thanks to the smaller number of paylines and reels. Play Fruit Slots for Real Money! 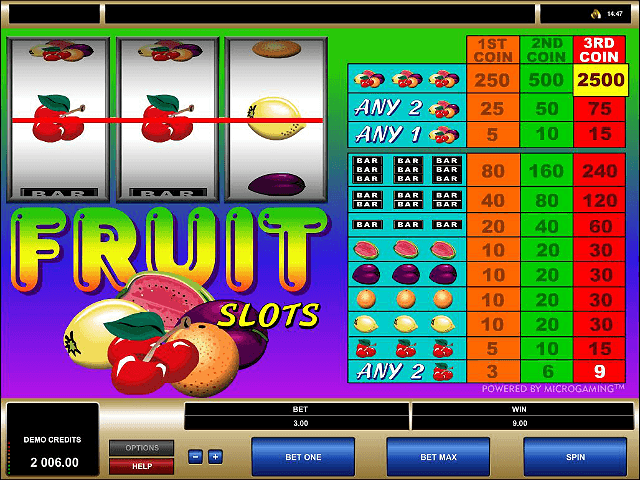 The graphics and sounds of Fruit Slots are elementary but effective. The overall design resembles an archetypal physical slot machine, and the reels are even designed to appear curved. The combinations are listed clearly to the right of the screen, so you can check what you need to win at a glance. The bottom of the screen shows you your credits, max bet, spins and so on. It's all bold and easy to read, and contrasts nicely with the bright colours of the theme. 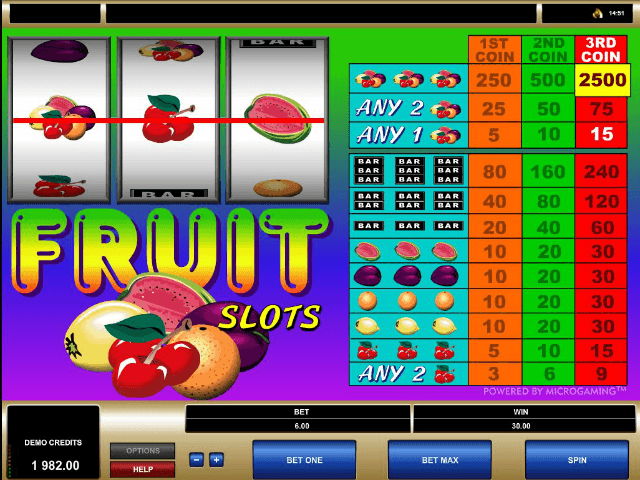 Even the symbols are retro for this online slot – there's the traditional watermelon, cherries and the iconic 'BAR' sign. If you want to win big, then you'll need to use your max bet. Having said that, this is a game of combinations, so you've got plenty of chances to receive some good payouts. 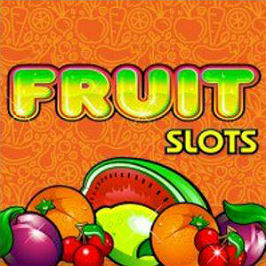 Taking your cue from the visuals, you won't be surprised to read that Fruit Slots is all about straight-forward gaming. It's very easy to pick up – even if you've never played slots before – and there are no complicated game modes or bonus features to confuse you. You can place a minimum bet of 0.25 coins, so it's worth giving it a try to test the water. Or the fruit juice. There's a jackpot of 2,500 coins as well, although you'll need to bet the maximum (15 coins) to be in with a shot of winning it. Other than that, there are no special rules – it's simply a case of matching the combinations as seen on the paytable. Get any three of the same symbol on the payline, and you'll win the corresponding amount. Symbols in Fruit Slots are unfussy and easy to identify. Their value is as follows: two cherries offers the lowest payout, then three cherries, followed by lemons, oranges, plums, and watermelons. The BAR icon offers the best standard payouts, with a triple BAR being the highest. There's also the fruit salad symbol, which in itself isn't anything special (you can win more by matching BARS). Everything changes if you go all-in, though. You can choose to add one, two or three coins at once to increase the stakes. This not only raises the potential winnings of all paylines, it also gives you a shot at the jackpot – 2,500 coins – if you can match three fruit salads. Overall, this is a great game for beginners or those after something understated with no gimmicks. 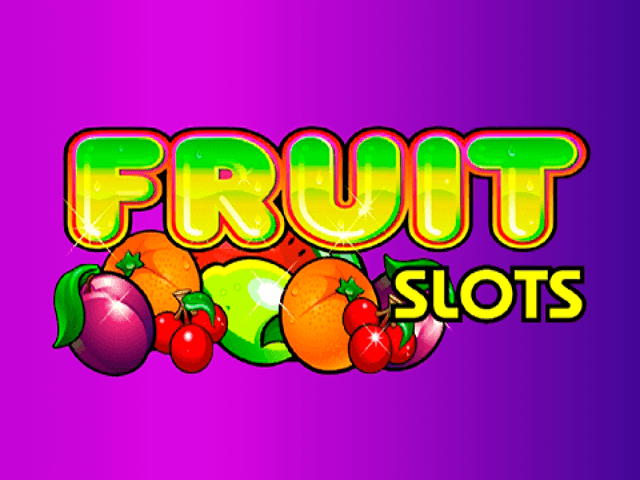 Share this Fruit Slots Review today! 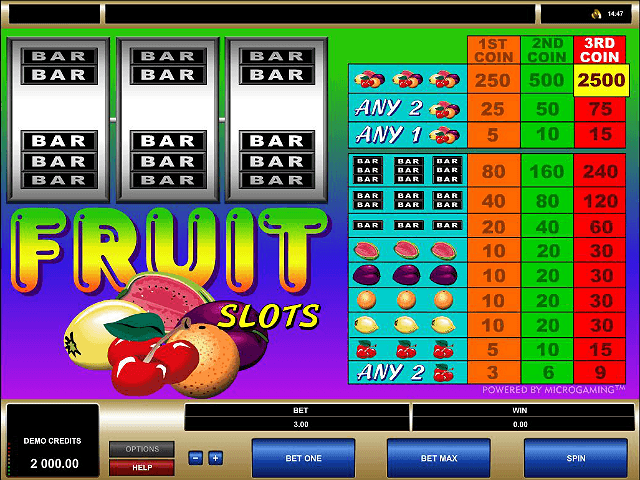 If you like Fruit Slots, you'll love these slot titles too!